This is the first half of a two-part series on Seattle breweries. Click here to see part two. Patrick and I are about to embark on our last day in Seattle. I'll post a follow-up to this one tomorrow about what we discover. Thus far, we've stopped in at five breweries, with three on tap for today. A longer discussion will follow, but our first impressions are these. The single biggest distinction between Portland and Seattle breweries is food. In Portland, rare is the food-free tasting room. (They exist, of course--Gigantic and Upright spring to mind.) In Seattle it's the norm, and this really changes the way one drinks beer. It's not great for the tourist who wants to be able to go out and enjoy beer but not starve to death (or get wildly drunk) in the process. The beers themselves don't represent a huge departure from Portland: no surprise there. Hoppy ales are the overwhelming category favorite, which you'd expect in the Pacific Northwest. We've seen pilsners nearly every place we've gone, and this seems suggestive of ... something. (Theories?) It is nevertheless a welcome trend. Below are some photos of the places we've visited. Centerally-located and the most IPA-centric of the breweries we've seen, Cloudburst is certainly one of Seattle's best. If you like hops, this is the place to come. 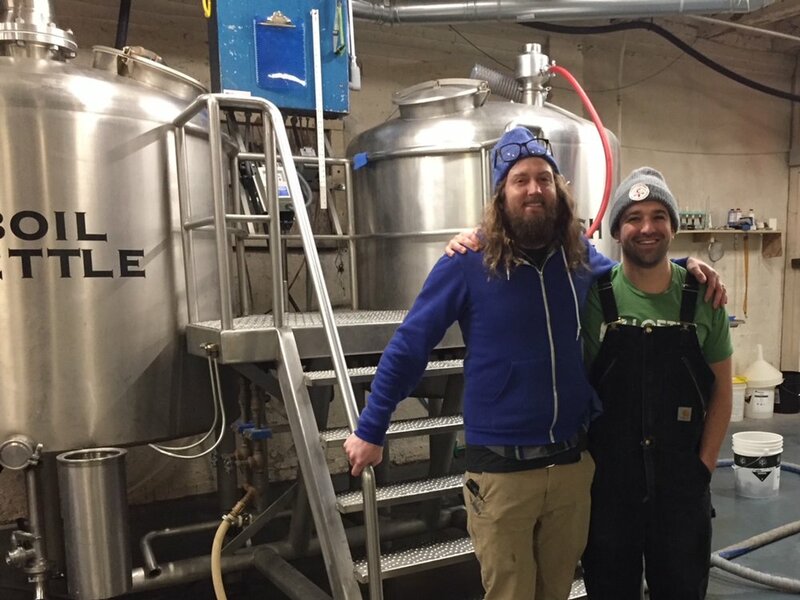 The two men behind the beer (there are only four employees total), Steve Luke and Zach Kornfeld, have been at a bunch of breweries together, getting their start back in Portland, ME at Allagash. Their experienced hands are everywhere evident. Curiously, Cloudburst makes only one regular beer, and it's a dry-hopped pilsner. It had blown Sunday night, but after seeing our tweets, Steve invited us to stop by yesterday morning for a sample from a newly-racked keg. After Cloudburst, we had to land at a place that offered food, so we chose Redhook's new downtown test brewery, Brewlab. I didn't get a lot of photos, but I did grab one of the mash filter they have on the tiny system. (Mash filters are a kind of tech largely used by industrial-scale breweries. They substantially improve mash efficiency.) It's a fairly upscale place and a big contrast to the garage-like feel of Cloudburst. They do a lot of different beers there, many interesting and experimental. I tried a pilsner made with Washington-grown triticale (a wheat/rye hybrid). and was impressed. It had a rustic kellerbier appearance, but was refined and delicate in the palate. We're going to have a full podcast with an interview we did with co-founder Matt Lincecum, so I'll be brief here. Fremont is a successful, quickly expanding brewery that may soon be Seattle's largest. Matt and his wife Sara Nelson don't come from brewing backgrounds, but they've thought very deeply about both the beer and business they want to have. As I understand it, Ballard is ground zero for new brewery openings, and Stoup is one of the stalwarts. They have a predilection for IPAs, but do other classic styles like an English brown, kolsch, and porter. A pilsner and dry-hop sour were standouts for me. To address the lack of food, Stoup (which does have a food truck outside) has a jerky vending machine, which gets them extra points in my book. Also, dogs are allowed, and there were many happy four-legged patrons getting attention and head-pats. Of all the places we've visited, the vibe and drinking environment was most pleasant at Stoup. We finished up at Seattle's most-recommended brewery, Holy Mountain, which specializes in complex, barrel-aged beers. They were excellent; balanced, harmonious, and complex. I, however, liked their little 4.5% Black Beer the best. It was creamy and rich and roasty, a perfect tipple for nights when the rain is rattling the windows. The brewery itself is also an interesting showcase. It's got bare, whitewashed walls and has soaring ceilings, which give it a churchlike feel. They've gone for an austere vibe there--very different from the cluttered, homey vibe at Stoup. We were joined for part of the adventure by BeerAdvocate Magazine's Ben Keene who gave us an important pro tip about the Holy Mountain visit. Next door is Windy City Pizza, and you can get a pie to go and take it to the pub. Holy Mountain encourages this and even gives you plates and forks to eat it with. How Healthy is the Craft Beer Segment?